Penguins general manager Ray Shero spent the last few years ensuring the team’s long-term competitiveness and success by locking up a solid foundation of players to multi-year contracts. Now the Penguins have locked up the foundation’s foundation. The Penguins and Shero have agreed on a five-year contract extension that ensures the team’s 2009 Stanley Cup champion architect will remain in Pittsburgh through the 2015-16 season. “I’d like to thank Mario Lemieux, Ron Burkle and the ownership group for showing confidence in me,” Shero said. “They made a decision to hire me back in May of 2006, and it’s worked out for both of us. The ownership group has supported me and given me the resources to do the job. The stability we get from with our ownership group is how you have success both on and off the ice. 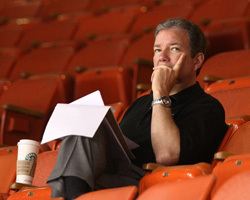 On the hockey operations front, Shero’s work speaks for itself. He helped rebuild the Penguins from a club that finished at the bottom of the NHL standings for five-straight seasons into a perennial contender. 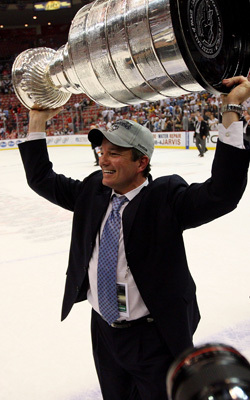 Shero inherited a team with an abundance of talent when he was hired May 25, 2006. But his fine-tuning and personnel moves helped Pittsburgh win the Atlantic Division and Eastern Conference title in 2008 and the Stanley Cup championship in 2009. Thanks to Shero, the Penguins will be a championship contender for years to come with the long-term signings of core players like Sidney Crosby, Evgeni Malkin, Jordan Staal, Marc-Andre Fleury, Brooks Orpik, Kris Letang, Zbynek Michalek and Paul Martin. Much has already been written and discussed about Shero’s craftiness and abilities in building a championship team (see below), but his philosophy and management style is highly underrated, and possibly his best asset. Shero modernized the Penguins hockey operations department, utilizing cutting-edge technology and scouting methods, upgraded and expanded the team’s pro and amateur scouting, added a player development director and created a player-friendly environment. Shero’s firm and honest approach and managerial style has set the tone for the Penguins team. And that philosophy will reign in the Penguins organization as long as Shero is in charge. Which, thanks to his new contract, will be for (at least) the next five seasons. languished in 10th place in the Eastern Conference standings with the hopes of a playoff berth fading. 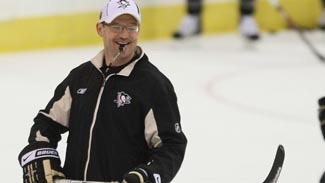 Sensing that the team needed a drastic change, Shero promoted Wilkes-Barre/Scranton coach Dan Bylsma to “interim” head coach of the Penguins and named Tom Fitzgerald as “interim assistant coach” – changing the course of the team’s history forever. The Penguins responded with a furious 18-3-4 finish and climbed to fourth place in the conference standings – capturing home-ice advantage in the opening round. During the postseason, Pittsburgh trumped Philadelphia, Washington, Carolina and Detroit to capture the Stanley Cup. Shero has never been afraid of aggressively pursuing ways to make the Penguins better, particularly around the NHL’s trade deadline. In 2009, Shero traded for Chris Kunitz (Anaheim) and Bill Guerin (NY Islanders), and claimed Craig Adams (Chicago) on waivers. The three players played pivotal roles on Pittsburgh’s Cup-winning finish. Shero made the biggest deadline splash in 2008 when he acquired the most-valuable commodity available in super sniper Marian Hossa (Atlanta), as well as Pascal Dupuis (Atlanta) and Hal Gill (Toronto). The additions helped Pittsburgh win the Eastern Conference title and advance to the Stanley Cup Final for the first time since 1992. Dupuis and Gill would help the Penguins claim the most-coveted trophy in sports just one season later. In his first season in Pittsburgh, Shero added Georges Laraque (Phoenix) and Gary Roberts (Florida) to help the team end a six-year playoff drought and laid the groundwork for future postseason success. 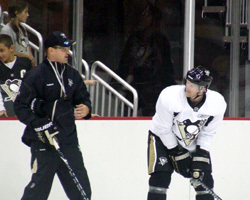 Shero was named Penguins general manager May 25, 2006 and had less than a month to prepare for the 2006 NHL Entry Draft – where the team held the No. 2 overall selection. In Shero’s first major player personnel decision, he selected Peterborough stud Jordan Staal. The 6-foot-4, 215-pound center made the immediate jump to the NHL as an 18-year-old rookie, scoring 29 goals and a Calder Trophy (rookie of the year) nomination. Staal’s shutdown defensive abilities were crucial to the Penguins’ 2009 championship. The 2010 Selke nominee (best defensive forward) went head-to-head with opposing teams’ top lines during the playoff run – handling such players as Jeff Carter, brother Eric Staal and Marian Hossa. The Penguins were arguably the biggest winner of the 2010 NHL free agency period. Within the first few hours of the opening bell, Pittsburgh had locked up two of the best defenseman available (Zbynek Michalek and Paul Martin) to five-year contracts – giving the Penguins one of the best defensive units in the league. But what gave Pittsburgh the upper hand over the rest of the league was the pre-free agency strategy. The four best available blueliners on the market were Sergei Gonchar, Dan Hamhuis, Martin and Michalek. Gonchar and the Penguins were already in the midst of contract negotiations when Shero pulled the trigger on a trade that changed the free agency landscape. At the conclusion of the first round of the 2010 NHL Entry Draft, Shero sent a 2011 third-round choice to Philadelphia for the rights Hamhuis. The deal gave Pittsburgh exclusive negotiating rights for Gonchar and Hamhuis. The Penguins worked diligently to sign Gonchar and Hamhuis, but as the deadline approached it became clear that both parties were too far apart. At that point, Shero turned his attention to Michalek and Martin. As soon as free agency struck, teams spread their resources in an attempt to land one of the four highly valued defensemen. But the Penguins didn’t waste time on Gonchar or Hamhuis. Thus, Pittsburgh was able to double-down its efforts and throw all its power at Michalek and Martin. The result: Michalek and Martin will be wearing Penguins sweaters for the next five seasons. The importance of the Hamhuis trade cannot be underscored. The Penguins were not able to sign Hamhuis, but the deal was a springboard to signing Michalek and Martin. If Pittsburgh hadn’t brought in Hamhuis, then the club would have used precious time and resources to sign him on the first day of free agency, and may have missed out on Michalek or Martin, or both. It looks like giving up a third-round pick in exchange for adding two long-term cornerstones to the defense is a BIG win for Shero and the Pens.